Give life to digitized books. On iPad ! Geneza is excited to announce the imminent availability of MediaINFO™ end user application on the most popular mobile tablet device, Apple’s iPad. Now you can access MediaINFO™ servers from anywhere. MediaINFO is the complete software solution for intuitive viewing, browsing, searching, cataloging and distributing digitized content like (but not limited to) paintings, maps, books, newspapers, manuscripts, and other scanned material. You can add your own sources of data. Please contact your Library/Museum or other content provider for the instructions. We will be updating a list of sources that are compatible with MediaINFO. Delight your users with MediaINFO for iPad. 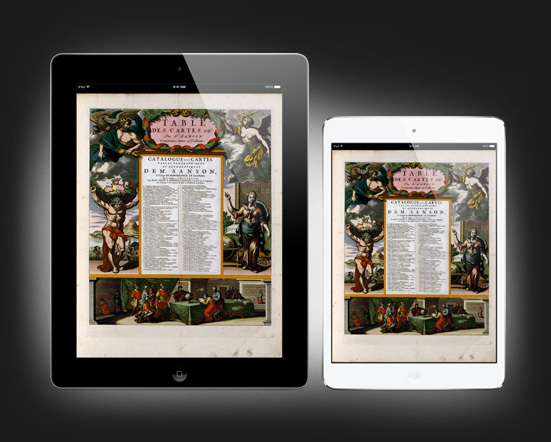 Mobile devices are not thought of as the ideal computers to view busy layouts such as scans of books or manuscripts and other digitized images. MediaINFO is changing all this with the unique ability to display unlimited detail in real-time. Discover the lost detail in ancient maps at the full optical resolution of the capturing device, every penstroke, illustration, or ornament in the margin of a historical book can be explored with the same intimacy as holding the original and all from the convenience of your iPad! Only with MediaINFO can you access a historic issue of a newspaper where you can zoom into photographs and pictures to the point you can actually recognize minute details of people in clear undistorted clarity. MediaINFO is powering some of the world's most prestigious national libraries, publishers, educational & government institutions, and magazines. MediaINFO helps organizations utilize and re-use their content more effectively by leveraging past investments in content and re-purposing them for new audiences, over a network or the Internet. MediaINFO can easily be used on Apple iPad inside your organization through your wireless network. MediaINFO already works on laptops and desktop PCs running Windows, MacOS or Linux. This creates a great common standard where people can collaborate and share without being limited by what computer they use. Another great practical benefit for your organization is that every area of your building into a study area and extends the reach of your collection to the limits of your network or the unlimited world of the Internet. Your institution maintains tight control on what is made available to whom and where, based on your needs. © 2014 Geneza. All Rights Reserved. MediaINFO™ is a trademark of Geneza. All other marks may be the property of their respective owners.